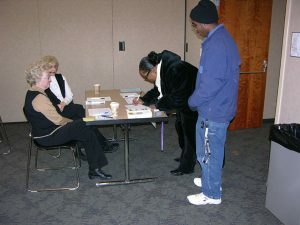 I was heavily involved in President Obama’s first campaign in 2007 (caucus) and 2008 (general). On January 5, 2009, I received a phone call from a person with the Presidential Inaugural Committee about the 2009 MLK Day of Service which would fall on the day before President Obama’s first inauguration. 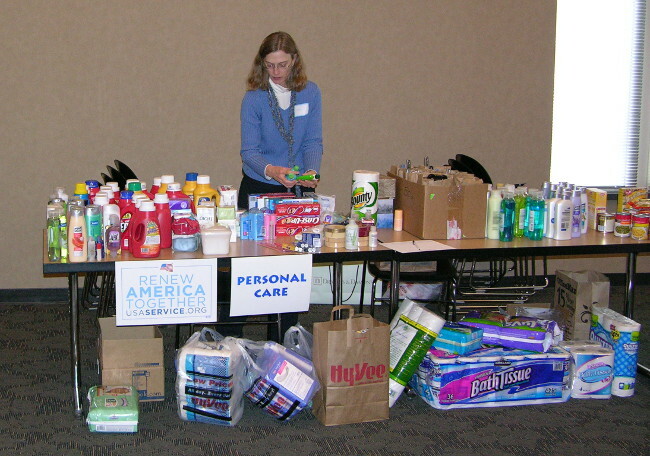 The caller was looking for someone to organize a National Day of Service event in Urbandale. This was part of Obama’s call to continue the grassroots efforts that supported his campaign to engage in community service going forward. I decided to accept the challenge, even though I only had two weeks to organize it. I had to think and act quickly, and it was a little rushed getting things organized and finding a suitable place. The Urbandale Food Pantry opened in October 2008 to serve residents of Urbandale and Windsor Heights, Iowa. The service event idea I had was to collect items for the Pantry, but to expand it beyond food and personal care items to include basic art supplies for children and winter scarves (preferably hand-knitted). Knitters were invited to come and knit their scarves during the event, which was held in a meeting room at the Urbandale Public Library. 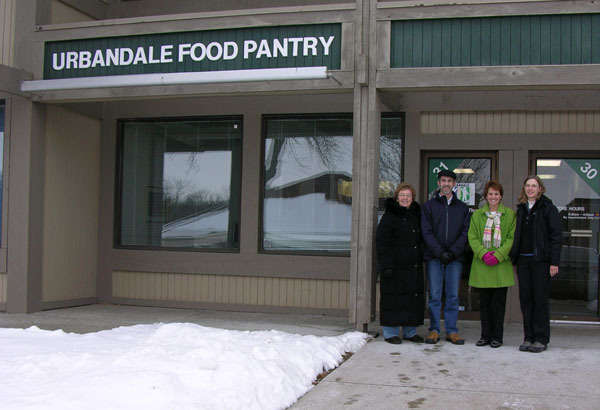 We reached out to residents community-wide, and especially church supporters of the Pantry, Pantry volunteers, area knitting groups, and Obama supporters and volunteers. 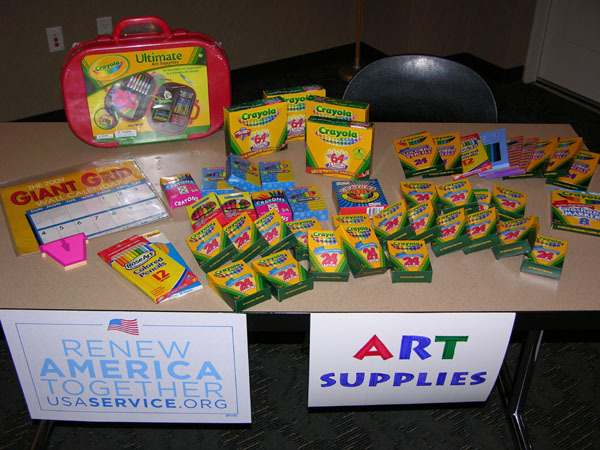 I called the event: Give Food, Give Warmth, Give Art. 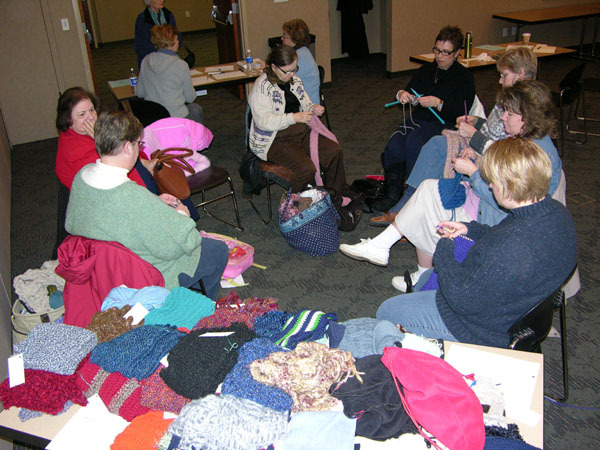 The morning began with a flurry of donors bringing in items and knitters arriving to knit. Knitters came and went throughout the day, as did folks bringing a variety of items. 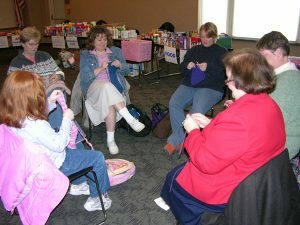 The Des Moines Register reported on our event, with a photo accompanying a story on the front page of the Metro section the next day. 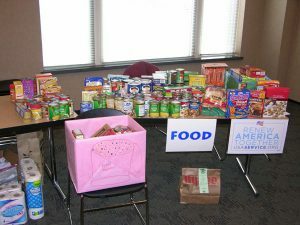 I was amazed at the response from the community in both numbers of items collected and volunteer involvement. 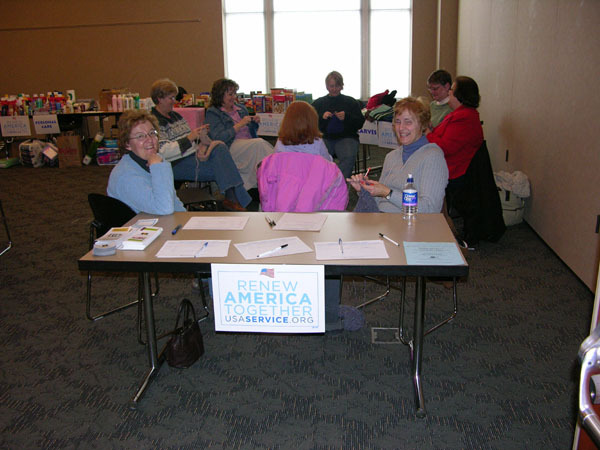 Throughout the six-hour event, volunteers staffed the front table, at least 16 knitters sat and knitted for awhile, adults and children carried in bags of food and other items to leave, and volunteers helped carry all of the items to vehicles and unload them at the Pantry. The enthusiasm was noticeable in nearly everyone who stopped by. In all, we collected at least 536 personal care items, 305 food items, 66 scarves and other items (including at least 35 hand-knitted items to which we attached little cards that said “hand-knitted for you by [knitter’s first name]”), 48 art supplies, and $140 in monetary donations, for a grand total of nearly 960 items.